Looking for indoor paintball in MN? All paintball players have played outside in wide-open fields, speedball courses, or woods ball many times; but not all have experienced the fast-paced, adrenaline pumping indoor paintball at MN’s premier paintball location, our Minneapolis indoor facility – Splatball. Players can experience the added excitement of a close-combat style indoor-range any time of year. From new players to the most experienced, affordable fun is waiting at the finest indoor paintball in MN. Stay out of the cold this winter, and enjoy the action-packed intensity and comfort of top-notch indoor paintball at MN’s unparalleled paintball facility – Splatball. For individuals looking for walk-on action, or a group planning a private session, this facility has it all. Gamers can bring their own equipment or rent from our onsite equipment shop. Every year the popularity of paintball continues to grow around the country. Year round action in our climate-controlled, 10,000 square foot, indoor facility offers players the best of the best. 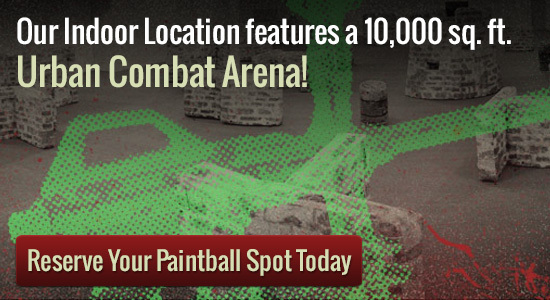 Rain or shine, our downtown arena provides paintball fans a place to play in an urban-combat style layout with an observation area, private party room, and Minnesota?s largest paintball pro shop. To book a private group reservation please give us a call at 612-378-0385. By reserving a spot for your group you are ensuring private use of the playing fields, your own party host, as well as all day admission to the park. Our minimum group size is 8 but we are able to accommodate groups that are as large as 150 people. Don’t have 8 people? No worries! Walk-on play is available Friday and Saturday from 7pm until Midnight and Sunday Noon until 5pm.